One hundred and thirty students were recognized by the Optimist Club of Hartland, Michigan during their recent Youth Appreciation Week. At least once a year, most Optimist Clubs will take time out of their schedule to honor special children for many different things, but most of all for being good role models and acting with kindness. This group was given the Angel Award. The Angel Award is given to students who demonstrate care and respect for others. Students ranged from kindergarten through high school. The program included the presentations to the students and a keynote address by Gabrielle Ford that encouraged the students and all in attendance to see the good in everyone and be the best you can be. 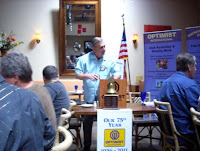 Optimist Clubs are unique in their mission to bring out the best in others. Events like Youth Appreciation Week do just that. Congratulations to all, students, parents, teachers and Optimist Club members in Hartland, MI. Please click here to see more photos from the evening. Photo credit: Sherri Yezbick-Taylor with the Hartland Patch. Last evening, Optimist International President Danny Rodgers announced on Facebook that he was about to go on stage with magician David Copperfield. His wall lit up with such comments as "Don't disappear," and "Wow, that is way cool." Evidence of his survival came this morning when @OptimistOrg tweeted, "This is no illusion @OIPresDanny on stage with @D_Copperfield presenting "Bringing Out the Best" Award." Danny and Jill Rodgers have been in Las Vegas since Sunday to present "Bringing Out the Best" awards to two deserving individuals. First was Tony Hsieh, CEO of Zappos.com and author of the book Delivering Happiness. 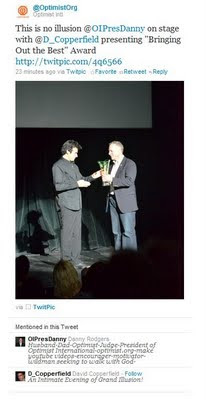 He then went to the Tuesday evening show with David Copperfield to make the presentation on stage. Copperfield was recognized for his work with children through Project Magic. The Bringing Out the Best Award was created so the international president of Optimist International can recognize an individual that has inspired him or her through the years. 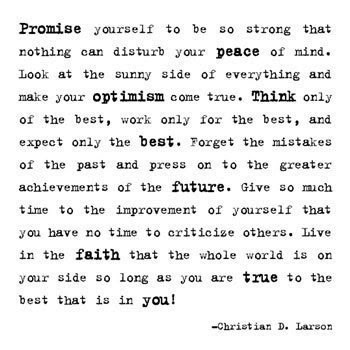 It is an award to acknowledge optimism and the ability and willingness to bring out the best in others. The Optimist Club of Brighton, Michigan will host the 25th Annual Fishing Derby on June 11. It will be held, as usual, at the well-loved and fondly remembered Mill Pond, the site of all previous fishing derbies and where many people in the community first learned to fish. To commemorate this special anniversary, the Optimist Club has commissioned a sculpture from nationally-known artist and Brighton artist Mike Monroe. The sculpture, design shown here, is being created with children in mind. They will be able to touch it, crawl on it, and learn from it. The design process included kids who reviewed a selection of concepts and ultimately chose the one that would be created. In fact, kids even helped name it when one young man exclaimed, "That's a keeper!" 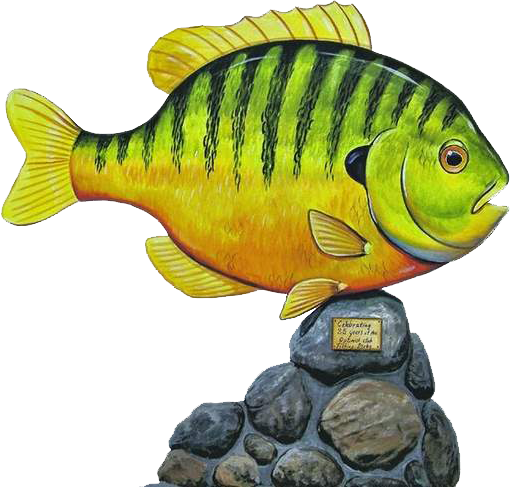 The sculpture will be placed at the Imagination Station at Mill Pond and dedicated on June 11, 7:30 a.m., immediately before the fishing derby takes off. Photo courtesy of the Brighton Optimist Club. Should service clubs invest in real property? When one hears that we are "building a new Optimist Club," it is easy to imagine a brick and mortar establishment where members, friends and guests may gather. One might even keep imagining and assume that the reason people would gather there would be to share positive thoughts, optimistic stories, and projects and programs that would improve the quality of life in a community. Unfortunately, that is not the case. 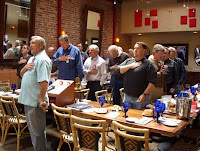 Most Optimist Clubs do not have their own building and they choose to meet in restaurants, libraries, churches and other public places that have inexpensive or free gathering spots. With greater acceptance of online communities, virtual Optimist Clubs are only a breath away, I'm sure; but I have to admit that while I enjoy my online time, and I have a lot of it, I also enjoy gathering in person, with friends, and new and old acquaintances. So when I see stories like the one I found today from Dunnville, Ontario "Optimist Club raising the roof, and more", I wonder why more clubs have not made an investment in their community in the form of real property. Boys and Girls Clubs do it. YMCAs do it. Elks Clubs do it. Some Optimist Clubs do it and do it well. Consider the multi-million dollar Optimist Youth Sports Complex developed by the Boise Noon Optimist Club and the City of Boise. 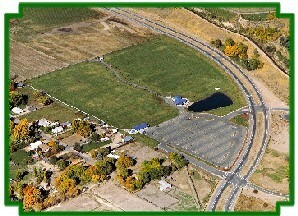 With fifteen football fields, tennis courts, fishing pond, playground equpment picnic areas, concession stands and bathroom facilities, and plans to add more amenities, the Optimist Club has made a significant investment in the community and made themselves a key player in the quality of life of the Boise community. More Optimist Clubs should do this. More service clubs should assist their communities in development and redevelopment efforts. Although small, quick and easy projects will always touch my heart best, I believe our communities would benefit from service club-driven economic development efforts. By joining together with friends to create and maintain new facilities, we share dreams, ideas and responsibility for making the world - our world - a better place to live. Easter has come late this year, and slowly with it, the season of rebirth and change. In Idaho, spring flowers have only begun to push their way above ground and some trees are budding while others are blossoming, heralding their intention to grow many leaves of green. Following the cyclical process we take for granted, we will go through spring, summer, fall and winter again and again, accepting the change, grateful for its familiarity and mesmerized by its hope. Each season brings with it a special joy; each season is its own season of love. That's why I have chosen 'Seasons of Love,' performed by the cast of Rent, for Music Sunday here at Experience Optimism. Enjoy spring, enjoy your life; and may you always experience love. The school year is almost over and high school seniors are making plans for their next big rite of passage: graduation. But before they graduate, many are seeking scholarships. Some might say it's a last minute attempt to "cash-in" on their good records; however, Optimist Clubs seem to seek out students who may not always be the top candidate for a prize so that they can give them the recognition and a boost when needed. 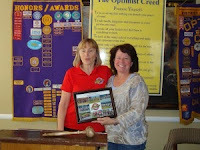 Take the Optimist Club of Washington, NC for example. They have scholarships available for students with 2.5 GPA or better who have participated in high school or Optimist sports programs. At first, I thought what? Rewarding athletes again? And then I looked at the Club website and thought, that is an effective use of their money. The Optimist Club of Washington has quite an extensive soccer program in addition to offering the traditional Optimist Club programs. 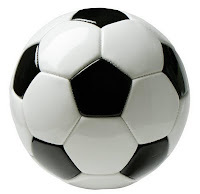 By connecting with the kids through soccer, they are able to engage students in living an optimistic lifestyle, being good students and good citizens, and they have a pool of participants for the Optimist International sponsored programs. It's only right that the Optimist Club returns the favor to those who have supported their programs throughout their young lives by awarding scholarships to them. That's an optimistic thing to do. Find out about the Optimist Club of Washington scholarships here. Five thousand eggs. That's right - in Idaho, the Middleton Area Optimist Club is combining forces with the Middleton Gazette to host a community Easter Egg Hunt with 5,000 eggs for the participants to find. Each egg has been filled with jelly beans or prize certificates and every child, ten and under, will leave the event with their fair share of eggs, candy and a prize. Becky O'Meara, publisher of the Middleton Gazette has been hosting the Easter Egg Hunt for many years, but this year she is enjoying help from the recently formed Optimist Club in the community. Members have been filling eggs and will be on hand to help set-up and carry out the event. The club hopes to help more individuals with other projects in the community throughout the year. "We're here to help, not take over," explains Patrick Halpin, President. 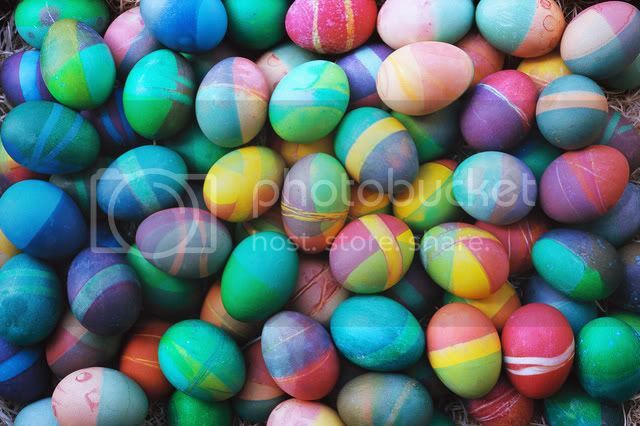 The Middleton Easter Egg Hunt will begin at10:00 a.m. sharp, Saturday, April 23, Foote Park, Middleton. Labels: easter, idaho, optimist club. 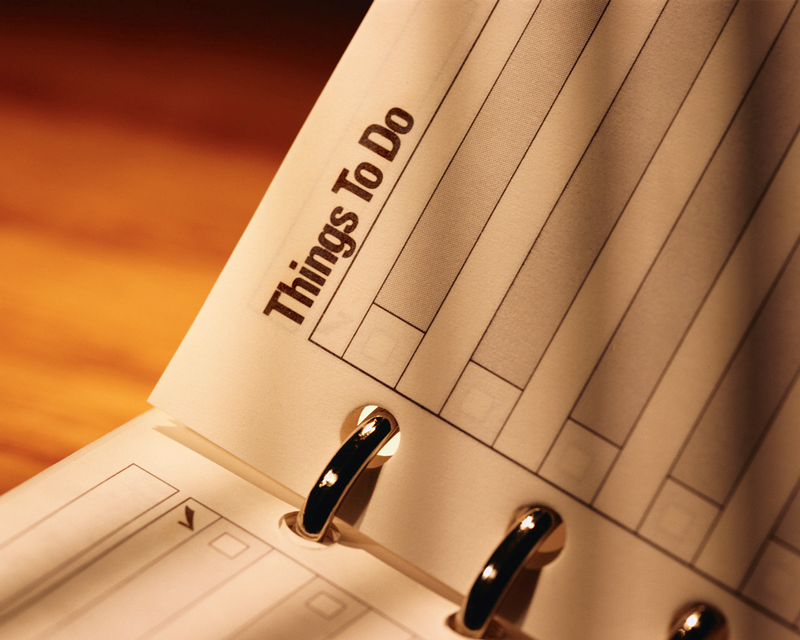 April 15 is usually known as tax day in the United States, but not this year. Due to a little known federal holiday, taxpayers got a reprieve and three extra days to work on filing their 2010 income tax return. Thanks to online filing, the lines at the post office appeared quite diminished today, so there was less outward proof of procrastination, but I bet that Turbo Tax will come out with some statistics soon to show the true nature of American slackers. Waiting until the last minute to finish any task is never the right thing to do; but do you know that procrastination is actually the result of impulsiveness? That's right, according to Dr. Piers Steel in Impulsiveness: Procrastination's Nickel-Iron Core, our body's ancient and primitive limbic system has the ability to override the prefrontal cortex thereby motivating us to seek instant gratification or sensations that can be felt instantly, in the moment. Is it more fun to watch a movie, play a game, eat an ice cream cone or, you know, file taxes? According Dr. Steel, when we don't expect to succeed, or don't value the task, the tendency to procrastinate becomes greater. However, the prefrontal cortex, the part of the brain that helps us make long-range plans, can also help determine consequences. Perhaps that is why the taxes are eventually completed. It is our large prefrontal cortex that separates us from our ancient ancestors. The prefrontal cortex gives us self-control. Self-control makes us human. Self-control promises long-range happiness. Self-control offers hope and creates optimism that the future is worth waiting and working for. And as for those taxes that are still waiting to be filed? The diet that has yet to be started? The homework or housework that awaits? The satisfaction and fulfillment that arises from a task completed may be delayed, but sweet nonetheless. Imagine that feeling, muster up that self-control and get there. Soon. "Some songs never die," comments a user on YouTube.com. I think I have to agree; if you were hitting the club scene in the '90s or just listening on the radio today, Rhythm is a Dancer by Snap will make you get up and move. It seemed like the perfect song to play on this pretty spring Sunday to excite action and progress. I especially like that when I went to look for the song on YouTube, I found different versions recorded through the years, but I specifically wanted to feature the two I have chosen for different reasons. The first player highlights the original artist, following up nearly twenty years later, live. Maybe the beauty of the techno genre is the ability to enhance any sound, but I think you will agree this version is just as good as the original. I also found this version remarkable. Recorded by Israeli singer and guitarist Sagi Rei, this version appeals to both a different culture and generation. Perhaps my age is showing, but I may like this one better for it allows me to enjoy my memories without trying to relive the time. I hope you dance, move and enjoy this Music Sunday at Experience Optimism. For an organization whose original motto was "Friend of the Delinquent Boy," Optimist Clubs do a lot of recognizing of good children. 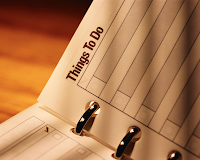 Could it be that Optimist Clubs believe in positive reinforcement of good behaviors? I would say so, yes. Optimist International has five driving purposes. (Purposes of Optimist International) All are aimed at making our society a better place to live by developing responsible, caring citizens and fostering a positive outlook on life. To that end, the founders of the organization created social programs to address the needs they saw in their communities and adopted a framework that would be flexible as time passed and needs changed. Since its adoption in 1922, the motto has changed from "Friend of the Delinquent Boy," to "Friend of Boy," to "Friend of Youth," and has now largely been forsaken in favor of the last clause of the mission/vision statement "Bringing out the Best in Children." Over the years, the needs have changed and Optimist Clubs have evolved to meet specific needs in their own communities. One constant has remained: Optimist Clubs help children reach their full potential by honoring them, recognizing them, working with them, and encouraging them to be better citizens. One might even say that Optimist Clubs hold Youth Appreciation Week year-round, fifty-two weeks a year and by showing their appreciation, they encourage others to try harder and do more to contribute to their families, schools and communities. Such positive reinforcement is a model for a positive, optimistic life. 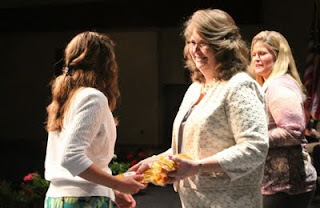 Thanks to the Optimist Club of Bixby, Oklahoma for the photo of Susan Bevard, Club President presenting honor cords to student members of the National Honor Society. Over the weekend, the Masters Golf Tournament was held in Augusta, Georgia. That rite of passage says to the world that the golf season is well underway. In Optimist Clubs, that is true as well. District Qualifiers for the Optimist International Junior Golf Championships have begun. More than 600 junior golfers will advance from the qualifying tournaments to the Championships, held at the PGA National Resort & Spa. And at home, in communities everywhere, adult golfers are also making plans to take to the links with fundraising efforts to help support not only junior golf programs, but also scholarship programs, youth appreciation efforts, and the many activities coordinated by their own Optimist Clubs throughout the year. 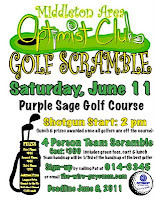 In Idaho, the Middleton Area Optimist Club is planning a golf scramble and they sent flyers out to the community today. I thought I would share it here as an activity that other Optimist Clubs may wish to do. If you live in the Boise area, please join them. Contact information is included on the flyer. Take a look at the banner in the middle of this picture. 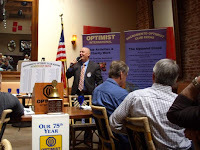 It proudly announces that the Optimist Club of Sacramento, Inc. has been serving the Sacramento, California community for 75 years. Congratulations! I was recently sent a copy of the Sacramento Optimist Club bulletin, and like many bulletins, it displayed pictures of the club members doing what club members do best - enjoying fellowship. There was talk of good natured fines being meted out; like the one levied on President Gene Winther for forgetting to appoint a secret greeter. 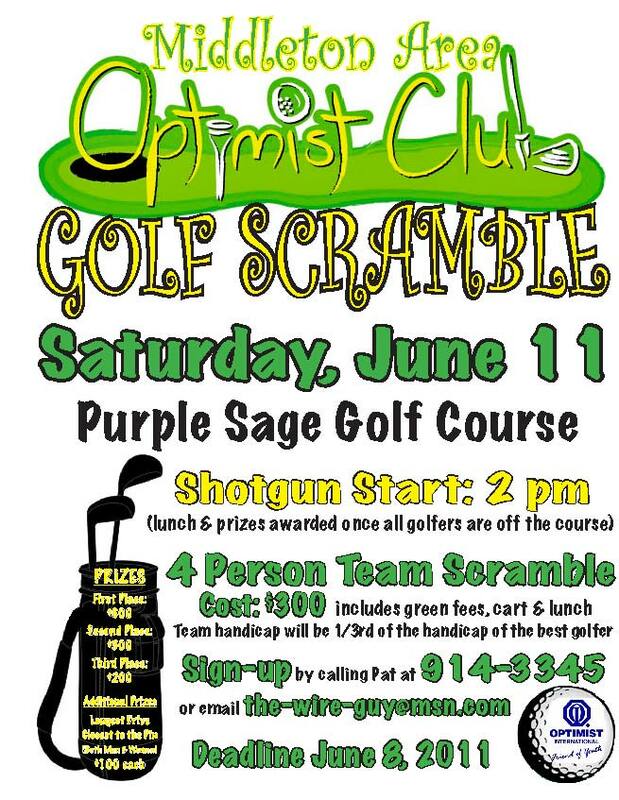 It's all in fun and the money raised goes to a good cause: the Optimist Club. The Golf Chair reported that sponsors had stepped up including a dinner sponsor and hole-in-one sponsor for a new car. 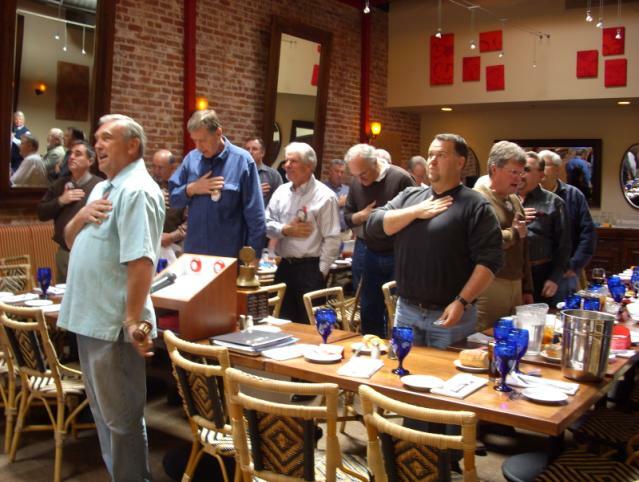 Like every Optimist Club in the US that I am familiar with, the Sacramento Optimist Club also began their meeting with the Pledge of Allegiance. I believe this act of respect sets a tone for members' conduct and relationships. To reach 75 years, a club or any group of people, have to share more than service and friendship; they also have to share fellowship. Fellowship is a relationship that is built on friendship, professional respect and the strong desire to work together to make a difference through service. I see all of that and more in the Optimist Club of Sacramento and am honored to share their story today. If you live in Sacramento, please stop by Lucca's Restaurant, 1615 J Street. Meetings are held on Thursdays, 12:15, and visitors, guests, and potential members are always welcome. Thank you to bulletin editor Flavio Soria for the inspiration and pictures for this post. "I just haven't met you yet," sings Michael Bublé in this week's choice for Music Sunday. It's a lighthearted look at the expectation of love and the delight that special someone will one day bring. I also believe that the same is true for friends. Have you ever noticed how some people have the uncanny ability make new friends everywhere they go? Others are not so magnetic, yet value the new friendships just the same. In Optimist Clubs, our doors are always welcome to new friends, and just as people have different personalities, so do our clubs. While some are always inviting, others are less outgoing. Please don't be afraid to extend yourself; reach out, find new friends by joining a service club near you. You can become a Friend of Optimist at this link. This link added by request on 4/11/2011.Thank you. Optimist International has extended the oratorical contest to include students with hearing deficits. 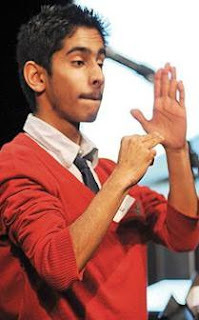 Called the Communication Contest for the Deaf and Hard of Hearing, students up to age 19 compete against one another to earn $2,500 scholarships in 49 districts around the world. Like their hearing counterparts, the students prepare and present a speech on the same topic. This year it is, "If I were leader of the free world, the first issue I would address would be..."
Yesterday in Eagle, Idaho, the Eagle Optimist Club hosted the first communication contest for deaf and hard of hearing students in the state in many years. Six students participated and three will advance to the district competition. It was a good start on an excellent program according to Chairperson Myrna Harris. "It was good this year, and next year will be even bigger and better," she said. Getting the program started in Idaho was a two-year project. Making the connections and plugging into the deaf community took some time, and honestly, happened accidentally as part of another program that Harris was involved with through the Ada County Sheriff's Department where she serves as an outreach and volunteer coordinator. Of course, it wouldn't have happened if the club had not been alert and reaching out to others. In Burnaby, British Columbia, the Optimist Club has connected to the deaf community through Deaf BC. For nearly ten years, they have held the Communications Contest for the Deaf and Hard of Hearing at the Michael J. Fox Auditorium. This year 27 students participated. 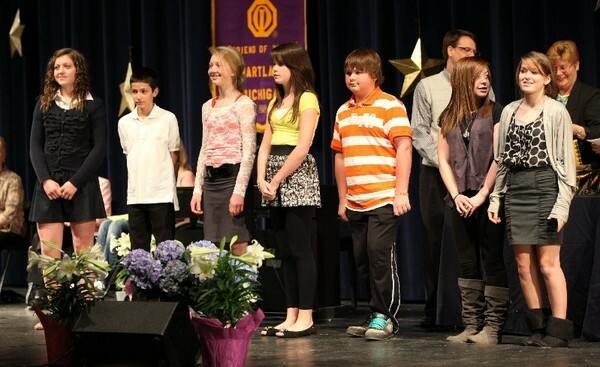 Their top three contestants will meet Eagle's top three at the end of April in the District finals. 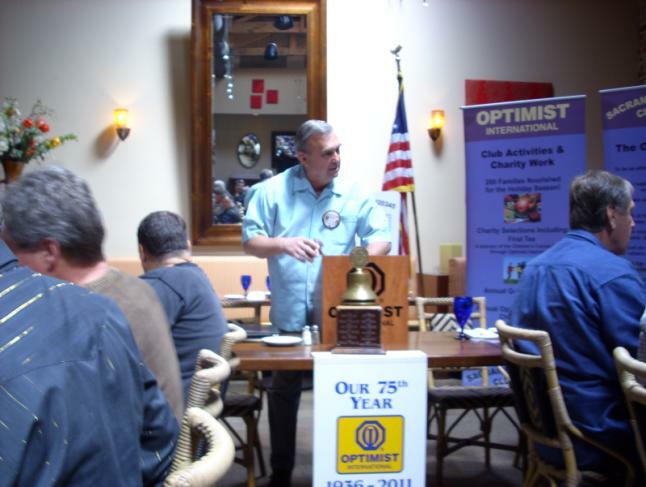 It is rewarding to start a new project and extend the reach of Optimist Clubs. It is especially fulfilling to touch the lives of students who face challenges with grace and poise. I believe that Optimist Club members learn from our students every year in the oratorical contests. Their views are fresh and full of hope and amazement. Through them, we experience optimism in action. With all the sports programs sponsored and coordinated by Optimist Clubs, it's always nice to see there are projects that serve differently-abled youth. The Achievers Optimist Club of Carlsbad, California is one of the clubs that makes a point to reach out to athletes with physical disabilities. Every year, they provide support to the San Diego Adaptive Sports Foundation. The money they give helps to ensure year-round access to a variety of sports, camps and clinics. Additionally, the Carlsbad Optimist Club supports Special Olympics, the Childhood Cancer Campaign, Stand-up for Kids, Military Families, Kare for Kids and the Optimist Scholarship Contests for Essay and Oratorical. The Carlsbad Optimist Club members are active fundraisers and carry out annual events like the Carl Tillinghast Golf Tournament, a Bowl-a-Thon, Night at the Theatre and Carlsbad Street Faires. One hundred percent of the funds raised by the club supports their work with children. Thanks to the Achievers for the photo and story. "It's time to untangle those fishing lines, dust off the bobbers and load up on bait," claims Alexis Bechman, Reporter, Payson Roundup. I couldn't agree more. The Fifth Annual Kids Fishing Festival in Payson, Arizona is just the first of the popular fishing events to make it to my inbox. As summer approaches, there will be many more. What I enjoy most about this fishing event are the pictures. Please click here for the headline photo taken by Max Foster for the Payson Roundup. Those kids are what being an Optimist Club member is all about. Teaching children to enjoy simple pleasures is often overlooked, but with a fishing derby, children get active, they are outside with adults and mentors; and they are joyful. Never doubt that smile of amazement when the fish is landed. Teach a kid to fish and they will understand patience and wonder throughout their life. Visit the Rim Country Optimist Club for more pictures from the 2010 event and information about the 2011 Kids Fishing Festival on April 9. We are fortunate in the fact that Optimist International President Danny Rodgers has been quite willing to broadcast via YouTube as OptimistArenaMan. And several weeks ago, as reported here, the organization broadcast an international board of directors meeting live via UStream. I cautioned that even though the media was free, they needed to be cautious about being concise, with a nod towards being entertaining. Which brings me to our Music Sunday video today: The Bed Intruder Song. Wildly popular with more than 19 million views on the official iTunes link as of this writing, this video shows what a little initiative can do for two families; and while we may smile at the enigmatic Antoine Dodson on the screen, we can't help but sing the ditty written by the Gregory Brothers and Auto-tune the News throughout the day. Enjoy. Optimist Clubs help keep children safe. They offer bicycle rodeos, internet safety awareness, personal safety demonstrations and now ... a program to teach Lawnmower Safety! How awesome is that? Lawnmower safety, just in time for the spring season, as entrepreneurial youngsters begin to line up their summer lawn mowing clients. 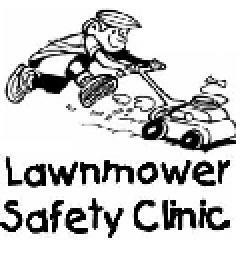 It's a free clinic, aimed at 5th through 8th graders, that teaches lawn mower maintenance as well as mower and trimmer safety. As a bonus, all participants are entered in a drawing to win a new gas powered trimmer. The Lawnmower Safety Program is coordinated by the Optimist Club of W. Knoxville, Tennessee and the University of Tennessee Extension Service and will be held on April 9. Parents or an adult must attend with the participant. If you live in or near Farragut, find out how to register here.